In this part of the JQuery Video Tutorial I will show you how to retrieve information from your server dynamically. 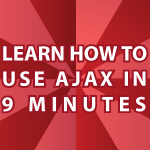 It is amazingly easy to implement AJAX concepts using JQuery. By the end of this tutorial you’ll be able to retrieve plain text and XML. You’ll also be able to access PHP code that can access databases, or any other type of information on your server. And, yes this works dynamically! If you need the JQuery library you can get it here JQuery. If you missed my previous tutorials on JQuery, they begin here JQuery Video Tutorial. All of the code used, follows the video. You can use it however you would like. Leave questions and comments below. Hey, is there any way to act based on the php responde, like if the data coming from the php file is ‘Ok’, then do this with jquery and if not then do that ! I really need some help here !! 1. Why does my browser spit out the message “object XMLDocument” after hitting the “Get Text” button? Instead of the proper text, of course. 2. Any idea how to make the browser use the data from the xml file only once? Love your tutorials but am having a problem with jQuery Tutorial #7. My local host chokes on the above “div class” statements. The error I get is “invalid XML name” which points to the div section of the code for the XML part. Any help would be greatly appreciated and keep up the great work!! Cannot get the php feature to work. All other features are working. Added GetDouble.php to the root folder of my project. This is just a txt file I renamed GetDouble.php.